Michele's Little World: Yoplait Fiber One Yogurt Gift Pack GIVEAWAY! Yoplait Fiber One Yogurt Gift Pack GIVEAWAY! Get enough fiber in your diet? Sometimes, it's difficult to get enough fiber in your diet when trying to manage your weight. With Yoplait Fiber One Yogurt you can enjoy a delicious cup of yogurt with 5 grams of fiber (20% of daily fiber intake) and only 50 calories per serving! This is a great nutritious product to enjoy anytime of the day. Not only is Fiber One Yogurt a great source of fiber, it's also packed with calcium, and vitamins A and D which makes this a great addition for those trying to either lose or manage their weight. Best-selling author and food expert Lisa Lillien, AKA Hungry Girl, has given her "seal of approval" to the new Fiber One yogurt, the only leading nonfat yogurt with 50 calories and 5 grams of fiber (20 percent of the Recommended Daily Value). It is also a good source of calcium and vitamins A and D, making this an all-around great choice for dieters and those watching their weights. Each cup includes the creamy, delicious taste you expect from Yoplait, and you don't have to feel guilty about enjoying it. 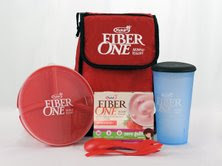 Fiber One is available in a variety of flavors including, Strawberry, Peach, Vanilla and Key Lime Pie. Of course my favorite flavors are the Vanilla and Key lime pie! This yogurt is creamy, smooth and has a wonderful taste and texture. One problem with most weight management products are "chalky", lack of taste, or are just plain disgusting. What I love about Fiber One Yogurt is that you cannot even tell it's good for you, it's THAT GOOD! Fiber One has restored my faith in better tasting weight management products. I have a difficult time stopping at enjoying just one cup myself, will you? I'd like to thank MyBlogSpark for providing me with the product information and sending me this great "Healthy & Fit Weight Management" gift pack of Fiber One Yogurt products to try and review. MyBlogSpark has also generously offered (3) of my readers a chance to win a gift pack as well! What's in the "Healthy & Fit Weight Management" gift pack? Print $1.00 off coupon for Fiber One Yogurt to redeem at your local grocer and try this product today! *What is your guilty snacking pleasure? *What do you do to manage your weight? *What are your diet secrets? BONUS ENTRIES: Please, leave a separate comment for each entry you complete. Winner will be chosen and contacted by email. You must reply within 48 hours with your shipping address (No P.O. Box) or another winner will be chosen. Once shipping information has been received, I will then contact the sponsor so that they can mail out your prize. cdziuba@aol.com Guilty snacking pleasure: potato chips and onion dip. My guilty snacking pleasure is ... anything chocolate! I am a new follower with Google Friends. Chips Ahoy chocolate chip cookies are my guilty snacking pleasure! I manage my weight primarily by doing weight training and cardio workouts at the local YMCA. My guilty snacking pleasure is goldfish, lol. My biggest diet secret right now is chasing my toddler twins. We also eat healthy and do not eat many pre-packaged foods. my guilty snacking pleasure is salt-water taffy. irresistable. My guilty snacking pleasure is hershey Chocolate Bars!! have to have one everyday!!! My guilty snacking pleasure is cold pizza. To manage my weight I only have one snack on on Friday and Saturday. I eat healthy the rest of the week. I just joined a gym to help me manage my weight. It's just too hot to walk outside, and when I am feeling healthy, I eat healthier, too. My guilty snacking pleasure is donuts. Thanks for the giveaway! My guilty snacking pleasure are fudge rounds. my guily pleasure snack is popcorn with tons of real melted butter. OMG so good. My guilty snacking pleasure? Oh my, there are so many! I would have to say that chips would definitely be up there. I eat them way too much. Potato Chips of any kind! Guilty snacking pleasure: late night chips and dip. My guilty snacking pleasure is just about anything that is considered a dessert! I workout regular to prevent weight gain. Now that I'm in my 50's it's more difficult. My guilty snacking pleasure really changes depending on my mood (and let's be honest, ladies - probably my cycle, too). Lately it's been sugar candies (Twizzlers, SweeTarts, Nerds, etc.). I have found that snacking on things like yogurt regularly keep those cravings at bay unless my emotions get too wound up. Combo's are a guilty snacking treat for me. That or Chex Mix cheddar flavor I can devour a whole bag of. Reeses Mini Peanut Butter Cups. Thanks! My guilty pleasue is nachos- I just love em! I Love pizza, that's my weakness. I love to eat nachos. So I guess that is my guilty pleasure. Cake with icing of any kind, love cake! A Yoplait a day keeps the doctor away. My favorite regular flavor is Chocolate Mousse, but there is only one store nearby that carries it. Please spread it around to the others. My guilty snacking pleasure is Doritos Nacho chips. My guilty snacking pleasure is Salt and Vinegar Chips. My guilty snacking pleasure is Lays potato chips. My diet secret is keeping hydrated throughout the day. And also drinking a full glass of water before meals. My guily snacking pleasure is Salt and Vinegar chips! My guilty snacking pleasure is chocolate! It's so cliche but so true! I am trying to figure out a diet secret, my doctor wants me to lose 16 pounds in 2 months "sighs" I have been watching everything I eat and walking. My guilty pleasure is chips! I run 15 min every morning! My guilty snacking pleasure is Dove chocolates. I try to limit myself to only one every night but sometimes I need two. My guilty snacking pleasure is potato chips.